The videographers at 3-2-1 LEGAL VIDEO INC. of Chicago, Illinois, provide you with vivid ,HD perfectly clear video. 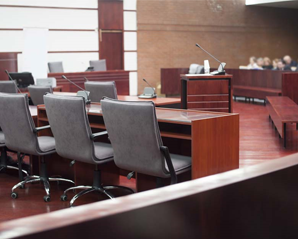 We work closely with attorneys and court reporters to present the best possible record to the jury. All content is delivered in the format of your choice via Dropbox™ to your computer, tablet, or smartphone. You will also receive an HD DVD of your video. .To request a videographer, click Schedule/Video above. Our courtroom playback and document presentation is done professionally, using state-of-the-art audio and video equipment. With our 3000-lumen projector and an 80" or 60" projector screen, you never need to dim the courtroom lights. Your presentation is made clearer with Bose™ stereo speakers, a document presenter with 2D and 3D capabilities, and high-powered PC computers for DVD playback. Contact our experienced videographers with your request for a quote on our courtroom videography services.